Figs date all the way back to the book of Genesis in the Old Testament. They featured in the original Greek Olympics as a fruit eaten by the Olympians to give them strength and stamina. As a weight loss food, they are fantastic. 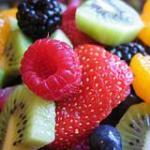 High in soluble fiber, they make us feel full quicker, but are low in calories, approx. 74 calories per 100g serving. They also contain no cholesterol. Figs contain mucin and pectin and are therefore believed to act as laxatives. Pectin also forms a gel in our stomach to hinder the absorption of fat. Pectin is also thought to be good for regulating our blood sugar levels, especially useful for diabetes. A 100g serving of figs contains 16g of sugar. Pound for pound, figs contain more calcium than milk, and are therefore great for our bone development. Figs are also high in potassium which is thought to help lower blood pressure. As with most fruits, buy figs fresh and eat as quickly as possible as they do not last long. Consider juicing them for a calcium boosting breakfast, or adding to a bowl of muesli. Dried figs are just as nutritious, but try to buy organic so they don’t contain chemical preservatives. If you have either kidney or gallbladder problems, you should not eat figs due to the presence of oxalates, which can crystallize and cause health issues. 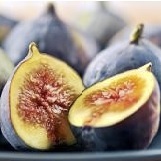 Compare fig nutrition facts to the other fruits.